Here are the best of the Dollar General Matchups from this weeks ad. Need more coupons? Check out the Coupon Database. As always, if you find a deal not listed leave a comment so we all can add it to our list. Details: This Farberware 10 Piece Cutlery Prep Set is ready to handle all of your cutting and chopping food preparation needs! Each knife in the set is quality-crafted from high-carbon stainless steel for strength and durability and features ergonomically designed handles for a comfortable grip. Set includes: 4-1/2 inch Santoku knife, 6 inch Santoku knife, 8 inch chef's knife, 5 inch utility knife, 3 inch paring knife, 8x10 inch polypropylene cutting board with nonslip accents, poultry shears, bent shears, kitchen shears, and household shears. Cutting board is dishwasher safe; all other items are hand wash only. Head to Housewares Deals today - a new deal every day on Brand Name Housewares! 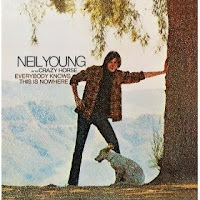 Head over to Amazon where you can pick up Neil Young's album "Everybody Knows This Is Nowhere" for just $3.99 today only!